Claudia Ochoa, left, with Julio Martinez Ellsberg, middle, and George Henriquez spoke about the political crackdowns in Nicaragua. The flag is upside down on purpose to symbolize their protest. Photo by Abraham Rodriguez. It has been nearly 40 years since the revolution began, and Nicaragua is once again in turmoil. The largest — and poorest — country in Central America is facing another uprising from its citizenry against government corruption — but this time, without weapons. Three members of the anti-government movement are touring the United States and asking for help, possibly even risking their safety to spread the word about their cause. Last night they spoke at the Women’s Building in the Mission District, and today will meet with city officials. Picture the scenario: A pro-business president accused of fraudulently winning elections has placed members of his family into key positions of the government. He has also amended the constitution to allow his wife to serve as his vice president and for him to run for a third term as the rule of law is gradually eroded. The public, fed up with blatant corruption, took to the streets earlier this year to protest the proposed cutting of Social Security benefits, an event that served as the catalyst for a national uprising. Because the movement was organized over social media, a flat “horizontal” structure was adopted, meaning the movement has no ostensible hierarchy. Anyone who is suspected of being a leader in the movement is ultimately arrested and taken in for interrogation. Pro-Ortega forces use fake Facebook accounts to identify organizers or members of the press and mark them for arrest, according to one of the activists. Widely disseminated Internet videos have revealed police in riot gear shooting into crowds of protesters full of women and teenagers. The crackdowns have led to hundreds of arrests and abuses of human rights, the activists told their San Francisco audience, including torture. Several journalists have been killed in the crackdowns. 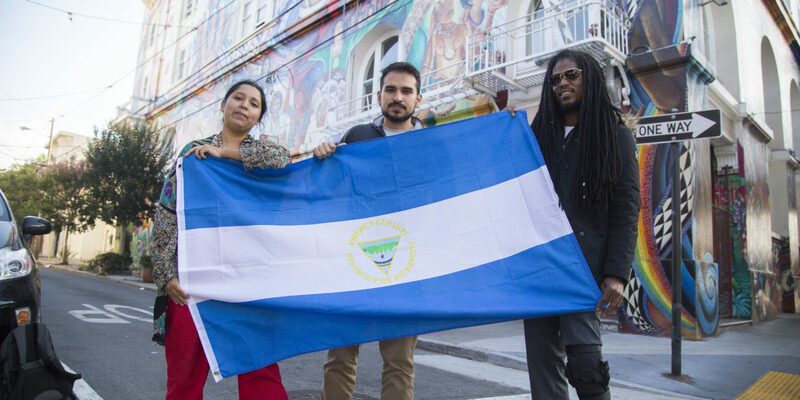 The three traveling activists all originate from Nicaragua. George Henriquez is a 30-year-old organizer from the Caribbean coast where English, Spanish, and Creole are the main languages. Claudia Ochoa, 24, is an architecture student who’s been with the movement since April, and Julio Martinez Ellsberg, 33, is the lead organizer for the U.S./Canada tour and an organizer in Nicaragua. His grandfather, Daniel Ellsberg of Pentagon Papers fame, gave an introduction to the crowd of around 40. Daniel Ellsberg, former RAND Corporation employee and whistleblower of Pentagon Papers fame, introduced three activists from Nicaragua. Photo by Abraham Rodriguez. All three came to North America to seek support from abroad and to dispel propaganda from Ortega’s government that things are back to normal. Far from it, the speakers said. “We have 300 people in jail right now just for demonstrating,” Ochoa said. In his introduction, Daniel Ellsberg said he traveled to the country in the 1980s at the behest of Ortega, meeting with him and the commandantes running the leftist Sandinista government. At the time, many anti-war and anti-imperialist activists felt aligned with the Sandinistas because of their progressive ideologies. But the same can’t be said now. 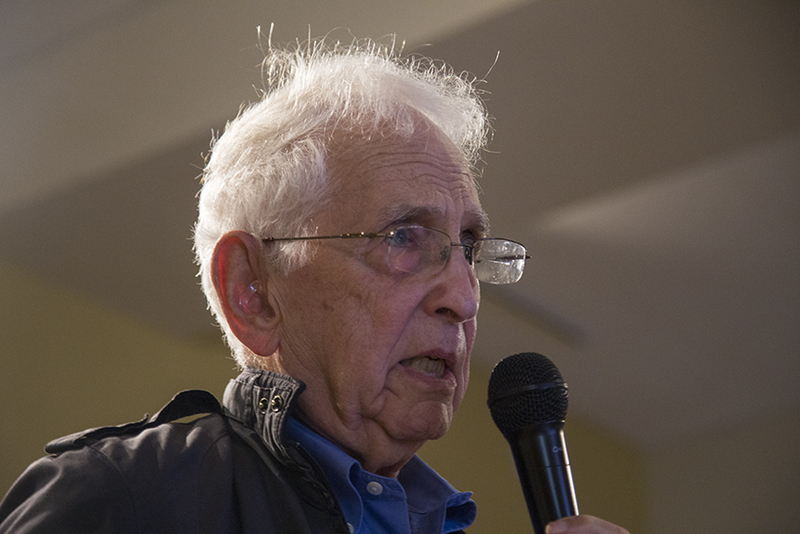 “The Daniel Ortega I met back then is not the same man in power now,” Ellsberg said. Henriquez spoke about land-grabs by private enterprise with permission from Ortega. The region on the eastern coast, around an area called Bluefields, is traditionally Creole and is interspersed with indigenous groups that have lived in the region since before the colonial era. Some of these interlopers were armed, he said, and clashes between the groups have already left some dead. The resistance movement aims to bring change through nonviolent means, much to the chagrin of some. Several of the audience members, part of the older generation who saw the wars firsthand, questioned the movement’s resolve and end-game goals. During a question-and-answer session, one man, who identified himself as a former Sandinista military officer now living in the Bay Area, asked why the movement felt directionless and would demonstrate on the streets without pushing things further. The room broke into chatter before Henriquez spoke. “Social media, civil disobedience, those are our weapons,” Henriquez added. Ultimately, the speakers said, the goals for the movement are for independent investigations and international oversight, constitutional reforms and the release of all political prisoners. Finally, the movement aims to have Ortega and his family step down before Nicaragua holds national elections. This trio plans on speaking across North America, including stops in Los Angeles, New York City, Washington D.C. and throughout Canada. The Bay Area events were organized by Bay Area Autoconvocadx Nic, a newly formed group with cultural and personal ties to Nicaragua. Daniel Ortega is a “A pro-business president”? The same guy who said capitalism is “in it’s death throes”? Are the Sandinistas no longer socialist? Did anyone ask the speakers about the Nicaraguan student leaders who came to the US on CIA dollars, asked the Trump administration to intervene and spoke to rightwing, interventionist Senator Marco Rubio and Rep. Ileana Pos-Lehtinen? Did anyone ask why the progressive governments of Cuba, Venezuela and Bolivia state that the uprising is an attempted coup sponsored by the US? Did anyone ask about the millions of dollars the CIA through its National Endowment for Democracy front has spent in Nicaragua teaching about “democracy?” Did anyone ask why the spokespersons for this uprising never mention the gains for the poor made by Nicaragua since 2008? Or the fact that until April this year Nicaragua was one of the safest countries in Latin America? Did anyone ask how many of the 400 killed might be government workers or supporters or their familes? Did anyone ask whether there might be a connection between what is happening in Nicaragua and US efforts to initiate another coup against Venezuela, or support for the legal coups in Brazil and elsewhere/ So many unasked or unreported questions.